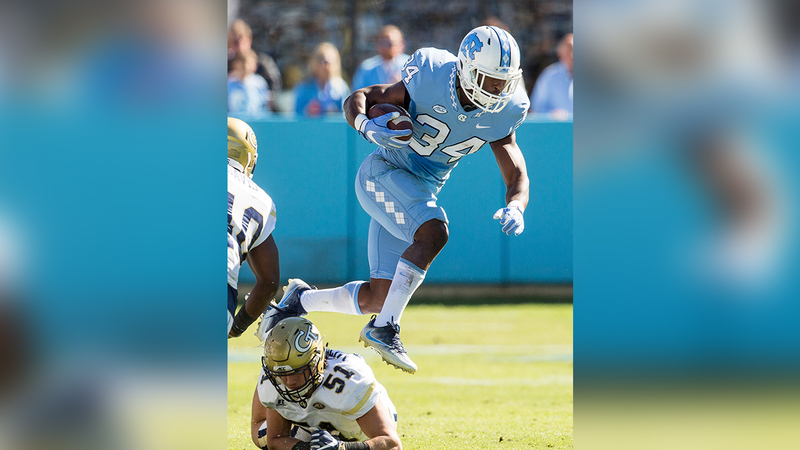 Bad news turned good fairly quickly for former Tar Heel Elijah Hood on Tuesday. He was cut by the Oakland Raiders (bad), but then picked up by his hometown Carolina Panthers (good). Hood was a seventh-round pick by Oakland last year after three sledgehammer seasons with the Heels. Hood was a 1st-team All-ACC performer for UNC in 2015, when he ran for almost 1500 yards and 17 TDs. He only dressed for one game for the Raiders last year, seeing eight snaps on special teams in a loss to Buffalo. The Panthers now have six running backs competing for likely three to four spots: Hood, Anderson, Christian McCaffrey, Cameron Artis-Payne, Fozzy Whittaker and rookie free agent Reggie Bonnafon.